Not to be confused with John Walker Lindh. Mohammed Emwazi (born Muhammad Jassim Abdulkarim Olayan al-Dhafiri; Arabic: محمد جاسم عبد الكريم عليان الظفيري‎; 17 August 1988 – 12 November 2015) was a British Arab believed to be the person seen in several videos produced by the Islamic extremist group ISIL showing the beheadings of a number of captives in 2014 and 2015. A group of his hostages nicknamed him "John" since he was part of a four-person terrorist cell with English accents whom they called "The Beatles"; the press later began calling him "Jihadi John". On 12 November 2015, U.S. officials reported that Emwazi had been hit by a drone strike in Raqqa, Syria. His death was confirmed by ISIL in January 2016. Emwazi was born Muhammad Jassim Abdulkarim Olayan al-Dhafiri on 17 August 1988 in Kuwait as the eldest of five children to Jassem and Ghaneyah Emwazi. The family, who were Bedoon of Iraqi origin, lived in the town of Al Jahra, before moving to the United Kingdom in 1994 when he was six. They settled in inner west London, moving between several properties in Maida Vale, later living in St John's Wood and finally in Queen's Park. Emwazi attended St Mary Magdalene Church of England primary school, and later Quintin Kynaston School. Emwazi was given the nickname "John" by a group of his hostages. The hostages said that he guarded Western hostages while handling communications with their families, and was part of a terrorist cell they called 'The Beatles' because the cell members all had British accents. The nickname refers to John Lennon of the Beatles; the three other group members were each given the first name of one of the other Beatles. The nicknames "Jihadi John", "Jailer John" and "John the Beatle" were created by journalists. 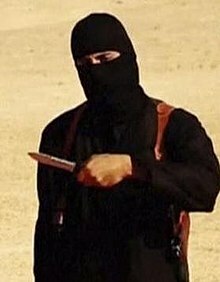 "Jihadi John" was used on 20 August 2014 in the conservative British magazine The Spectator in a piece titled "Jihadi John – a very British export" by Douglas Murray, a frequent critic of Islam. The Daily Mail first used "Jihadi John" in a piece dated 21 August, soon after joined by the BBC and other sources. On 16 November 2014 a video was posted by ISIS of Emwazi standing over a severed head, which the White House confirmed was that of Peter Kassig. Kassig's actual beheading was not shown, and unlike earlier hostage beheading videos he did not make a statement. There has been speculation that, faced with the prospect of being beheaded, he may have resisted and been shot dead: a senior surgeon performed a detailed examination of the video and saw possible evidence of a gunshot wound. The video that ended with a shot of Kassig's severed head showed the beheadings of a number of Syrian soldiers in gruesome detail, by a group led by a masked Emwazi. It was said by the BBC that, unlike previous videos, this one shows the faces of many of the militants, indicates the location as being Dabiq in Aleppo Province, and that this video "revels in gore." Unlike previous videos that cut away without showing the killing, Emwazi is shown beheading a victim. Initially, the number killed was variously reported as at least 12, or 18. Subsequent analysis by the Terrorism Research & Analysis Consortium and UK-based counter-extremism think tank Quilliam concluded that 22 captive soldiers were executed. The videos were produced and distributed by Al Hayat Media Center, a media outlet of ISIS that was under the authority of the ISIS's official propaganda arm, the Al-Itisam Establishment for Media Production, that targeted specifically Western and non-Arabic speaking audiences. British analyst Eliot Higgins (Brown Moses) published photographic and video forensic evidence suggesting that the James Foley video was taken at a spot in the hills south of the Syrian city of Raqqa. On 20 September 2014, the United States Senate approved a $10 million reward for information that led to the capture of anyone involved in the murders of James Foley, Steven Sotloff and David Cawthorne Haines. On 20 November, the bill, extending the potential scope of the reward program to any American kidnapped and murdered by a "foreign terrorist organization" and limiting the reward to a maximum of $5 million, was referred to the United States House Committee on Foreign Affairs. On 12 November 2015, two United States drone aircraft along with a British drone conducted an airstrike in Raqqa that targeted Emwazi as he left a building and entered a vehicle. US officials stated he had been killed, and a senior US military official was quoted as saying, "we are 99% sure we got him." A US official called it a "flawless" and "clean hit" with no collateral damage and that Emwazi was "evaporated." On 14 December 2015, US President Barack Obama stated Emwazi had been "taken out". UK Prime Minister, David Cameron, stated the US and Britain had been working "hand in glove, round the clock" to track Emwazi's location, and that the drone strike was "an act of self-defence." On 19 January 2016, in the ISIL magazine Dabiq, the group confirmed that Emwazi had been killed by a drone strike in Raqqa. The obituary showed him unmasked and referred to him as Abu Muharib al-Muhajir. Further photographs showing him unmasked in Syria were released on 26 January 2016. In July 2017, German journalist Souad Mekhennet published I Was Told to Come Alone: My Journey Behind the Lines of Jihad which details the hunt to identify and kill Jihad John, in part through the investigations of Souad Mekhennet herself. She was the lead reporter of a Washington Post story that first revealed his true identity. In September 2017, The Telegraph released video footage (obtained from an anti-ISIL activist) showing Mohammed Emwazi and other notorious ISIL members relaxing unmasked and talking casually. Jack Letts, nicknamed "Jihadi Jack"
^ a b c "First Photo of 'Jihadi John' As Adult Revealed". Sky News. 27 February 2015. ^ "Mother recognised Mohammed Emwazi's voice on hostage videos". BBC. 2 March 2015. ^ a b c "'Jihadi John': Why do we give notorious criminals nicknames?". The Independent. 2 March 2015. ^ "British doctor could lead to jihadist 'John the Beatle". New York Post. 22 August 2014. ^ "The hunt for British jihadist 'Jailer John'". The Times. 21 August 2014. ^ "Dozens of jihadis in fighting in Syria using the name 'al-Britani'". The Independent. 27 February 2015. ^ a b c "Jihadi John: A quiet man who hated Britain and was 'always ready for war'". ITV News. 25 February 2015. ^ "Mohammed Emwazi Revealed As Jihad John: What We Know About Islamic State's Most Wanted Man". The Huffington Post. 2 March 2015. ^ "Mohammed Emwazi: Man identified as Isis killer 'Jihadi John' 'stopped by MI5' while on safari holiday in Africa in 2010". The Independent. 26 February 2015. ^ "The moment Jihadi John may have become a terrorist". The Washington Post. 2 March 2015. ^ a b c "ISIS confirms death of 'Jihadi John'". CNN. 20 January 2016. Retrieved 16 May 2018. ^ a b c Topping, Alexandra; Halliday, Josh (2 March 2015). "Who is Mohammed Emwazi? From 'lovely boy' to Islamic State killer". The Guardian. Guardian News & Media Limited. Retrieved 9 March 2019. ^ a b "'Jihadi John' Used To Be 'Kind And Gentle'". Sky News. 27 February 2015. ^ "Jihadi John: Student record of Mohammed Emwazi leaked". The Daily Telegraph. 27 February 2015. ^ a b c d "'The best employee we ever had': Mohammed Emwazi's former boss in Kuwait". The Guardian. 2 March 2015. ^ a b "'Jihadi John': high degree of certainty US airstrike killed Mohammed Emwazi, sources say". The Guardian. 13 November 2015. ^ O'Neill, Sean; Tomlinson, Hugh (3 March 2015). "Spies were so much on Emwazi's case they bought his computer". The Australian. Archived from the original on 26 January 2017. Retrieved 9 March 2019. ^ a b c Malnick, Edward (26 February 2015). "Mohammed Emwazi timeline: from school years with Tulisa Contostavlos to becoming Jihadi John". The Telegraph. Telegraph Media Group Limited. p. 2. Retrieved 9 March 2019. ^ Al-Qatari, Hussain (2 March 2015). "'Jihadi John' born into stateless family in poor corner of wealthy Kuwait". CTV News. BellMedia. Retrieved 9 March 2019. ^ a b Casciani, Dominic (27 February 2015). "Islamic State: Profile of Mohammed Emwazi aka 'Jihadi John'". BBC News. BBC. Retrieved 9 March 2019. ^ Levy, Megan (5 August 2014). "How London rapper L Jinny became Jihadi John, suspected of beheading James Foley". The Sydney Morning Herald. Retrieved 9 March 2019. ^ Murray, Douglas (20 August 2014). "Jihadi John – a very British export". The Spectator. Retrieved 23 December 2015. ^ Williams, David; Marsden, Sam; Reid, Sue (21 August 2014). "Sadistic reign of 'jihadi John': British murderer brutally beat hostages and staged terrifying executions before demanding £80million ransom to free US journalist he later beheaded on video". Daily Mail. Associated Newspapers Ltd. Retrieved 23 December 2015. ^ McFarlane, Andy (22 August 2014). "'Jihadi John', fears for Gazza and GCSE 'ghost of Gove' in headlines". BBC News. BBC. Retrieved 23 December 2015. ^ a b c d e f g h i Rayner, Gordon (20 August 2014). "Video clues that could unmask James Foley's murderer". The Daily Telegraph. Retrieved 24 August 2014. ^ Saul, Heather (20 August 2014). "Steven Sotloff: Isis threatens second US journalist after 'beheading' of James Foley". Independent. Retrieved 25 April 2019. ^ Paul Lewis (2 September 2014). "Isis video purports to show execution of US journalist Steven Sotloff". The Guardian. Retrieved 2 September 2014. ^ Joshua Rhett Miller/AP (3 September 2014). "White House confirms authenticity of ISIS video showing beheading of reporter". Fox News Channel. Retrieved 3 September 2014. ^ "ISIS executes British aid worker David Haines; Cameron vows justice". CNN. 13 September 2014. ^ Hall, Ellie; Elder, Miriam (3 October 2014). "New ISIS Video Appears To Show Execution Of British Aid Worker". BuzzFeed News. BuzzFeed. Retrieved 25 April 2019. ^ Nye, Catrin (18 September 2014). "Alan Henning: Syria trips were worthwhile, says hostage". BBC News. BBC. Retrieved 25 April 2019. ^ "World reacts to IS video showing apparent killing of Alan Henning". BBC News. Retrieved 4 October 2014. ^ "Alan Henning: An ordinary man who wanted to help Syrians". BBC News. ^ "U.S. review of Islamic State video confirms American's death". USA Today. 16 November 2014. ^ Thompson, Mark (17 November 2014). "Peter Kassig's Powerful Silence Before ISIS Beheaded Him". TIME. Retrieved 25 April 2019. ^ "Peter Kassig 'killed by gunshot before he was decapitated'". The Telegraph. 14 December 2014. ^ "Abdul Rahman Peter Kassig 'died from gunshot rather than decapitation,' suggest researchers". The Independent. 15 December 2014. ^ a b "Abdul-Rahman Kassig: US hostage 'killed by IS'". BBC News. ^ "ISIL beheads Syria troops and US aid worker". Al Jazeera. 17 November 2014. ^ "ISIS's brutal beheading video: Search for clues". CNN. 8 December 2014. ^ "ISIS Mass Beheading Video Took 6 Hours to Film and Multiple Takes". TIME. 10 December 2014. ^ Ryall, Julian (18 August 2014). "Japanese man feared kidnapped by Islamic State in Syria". Telegraph. Telegraph Media Group Limited. Retrieved 9 October 2018. ^ Bajekal, Naina (21 January 2015). "Japanese War Reporter Was Abducted by ISIS After Trying to Save His Friend". TIME. Time Inc. Retrieved 9 October 2018. ^ "Islamic State threatens two Japanese captives in video". Reuters. 20 January 2015. ^ "Islamic State crisis: Jordan air strikes 'destroy' IS hideouts". BBC News. 8 February 2015. ^ CThe Associated Press (14 September 2014). "David Haines beheading: British PM vows to 'hunt down those responsible'". Canadian Broadcasting Corporation. ^ Christoph Günther (20 August 2014). "Der 'Islamische Staat' agiert hochgradig rational". Deutsche Welle. ^ Deborah Haynes (25 August 2014). "Foley video with Briton was staged, experts say". The Times. Archived from the original on 28 August 2014. Retrieved 27 August 2014. ^ "James Foley Beheading Video Has Play-Acting Portions – Video Experts Say". International Business Times of Australia. 23 August 2014. Archived from the original on 22 August 2014. Retrieved 23 August 2014. ^ "Media Forensics Experts Analyzing ISIS Video in Denver". Retrieved 15 September 2014. ^ "France 24: Exécution de James Foley: la traque de 'Jihadi John' est lancée". France 24. Retrieved 11 September 2014. ^ "Bellingcat: The Hills of Raqqa – Geolocating the James Foley Video". Retrieved 11 September 2014. ^ "Is this where James Foley was killed?". CNN. Retrieved 11 September 2014. ^ a b c d Nick Allen; Philip Sherwell (20 August 2014). "Hunt for 'British' Islamic State killer of US journalist James Foley". The Daily Telegraph. Retrieved 20 August 2014. ^ Sparrow, Andrew (20 August 2014). "PM returns from holiday after video shows US reporter beheaded by Briton". The Guardian. Retrieved 20 August 2014. ^ "Uncovering James Foley's killer". The National. 21 August 2014. Retrieved 22 August 2014. ^ Gordon Rayner; Alastair Beach; Martin Evans; Philip Sherwell (20 August 2014). "Hunt is on for ISIS terrorist: Video yields clues to identity of American journalist's left-handed executioner". National Post. Retrieved 3 September 2014. ^ Joshua Rhett Miller (3 September 2014). "White House confirms authenticity of ISIS video showing beheading of reporter". Fox News Channel. Retrieved 3 September 2014. ^ Sherwell, Philip (24 August 2014). "Britain 'very close' to identifying 'Jihadi John' – suspected killer of James Foley – says ambassador". The Daily Telegraph. Retrieved 24 August 2014. ^ Almasy, Steve (26 August 2014). "Britain close to identifying James Foley's killer, ambassador says". CNN. Retrieved 26 August 2014. ^ "US Senate Approves $10m Bounty for James Foley and Steven Sotloff ISIS Killers". 20 September 2014. Retrieved 22 September 2014. ^ "The British connection to ISIS beheadings". CNN. 14 September 2014. Retrieved 14 September 2014. ^ a b Crompton, Paul (26 September 2014). "FBI: U.S. identifies ISIS hostage executioner". Al Arabiya. Retrieved 26 September 2014. ^ Winter, Michael (25 September 2014). "FBI chief: ISIS militant in beheading videos identified". USA Today. Retrieved 26 September 2014. ^ Richard Kerbaj, Marie Woolf and Nicky Harley, London hip-hop artist key suspect in beheading, Sunday Times, 24 August 2014. ^ a b "London rapper Abdel-Majed Abdel Bary investigated as police hunt for 'Jihadi John'". London Evening Standard. 23 August 2014. Retrieved 24 August 2014. ^ "London hip-hop artist Abdel-Majed Abdel Bary key suspect in hunt for killer of American journalist James Foley". News.com.au. 25 August 2014. ^ a b c d e f "'Jihadi John': The Islamic State killer behind the mask is a young Londoner". The Washington Post. 26 February 2015. ^ "'Jihadi John' named as Mohammed Emwazi from London". BBC News. 26 February 2015. ^ "'Jihadi John' From ISIS Execution Videos Was Under Watch by British Intelligence". The New York Times. 26 February 2015. ^ "Parents of IS Executioner Iraqi". Arab Times. 1 March 2015. ^ "Mohammed Emwazi: Tanzanian officer recalls airport arrest". BBC News. 8 March 2015. ^ "Mother recognised Mohammed Emwazi's voice on hostage videos". BBC News. 2 March 2015. ^ a b "Mohammed Emwazi's father: no proof my son is Isis executioner". The Guardian. 4 March 2015. ^ a b "After Beheading of Steven Sotloff, Obama Pledges to Punish ISIS". The New York Times. 3 September 2014. ^ "Jihadi John is 'dead man walking', says former security minister". The Daily Telegraph. 3 September 2014. Retrieved 11 September 2014. ^ "David Cameron 'absolutely certain Jihadi John will be caught'". The Daily Telegraph. 4 September 2014. Retrieved 11 September 2014. ^ "Alan Henning murder: David Cameron vows to defeat ISIS". The Guardian. 4 October 2014. Retrieved 7 October 2014. ^ Whitehead, Tom (16 September 2014). "Jihadi John known to MI5 but may never be brought to justice". The Daily Telegraph. Retrieved 19 September 2014. ^ "Sotloff family want 'Jihadi John' jailed". BBC News. Retrieved 26 February 2015. ^ "Mohammed Emwazi: We won't get closure until there's a bullet between his eyes, says widow of aid worker David Haines". London Evening Standard. 27 February 2015. Retrieved 1 March 2015. ^ "Jihadi John, UK ISIS Murderer, 'Emailed Mail on Sunday Journalist About Security Services'". The Huffington Post. 1 March 2015. ^ "Jihadi John: Father accuses Mohammed Emwazi of being a 'dog' and 'terrorist'". The Telegraph. 3 March 2015. ^ "Security probes links to Emwazi". Arab Times. 3 March 2015. ^ a b "U.S. Airstrike Targets Notorious ISIS Militant 'Jihadi John'". Fox News Channel. Retrieved 13 November 2015. ^ "Jihadi John: US air strike 'targets Mohammed Emwazi in Syria'". BBC News. 13 November 2015. Retrieved 13 November 2015. ^ a b Brian Ross (12 November 2015). "'Jihadi John' Believed Killed in US Drone Strike, US Officials Say". ABC News. Retrieved 13 November 2015. ^ "Remarks by the President on the Military Campaign to Destroy ISIL". whitehouse.gov. 14 December 2015. Retrieved 15 December 2015. ^ Chan, Sewell; De Freytas-Tamura, Kimiko (13 November 2015). "Pentagon Says 'Jihadi John' Was Probably Killed in Airstrike". The New York Times Company. The New York Times. Retrieved 14 November 2015. ^ "Isis confirms 'Jihadi John' was killed in drone strike". The Independent. 20 January 2016. ^ "First pictures of 'Jihadi John' without mask in Syria". ITV News. 26 January 2016. Retrieved 28 January 2016. ^ Okeowo, Alexis (20 June 2017). "Souad Mekhennet's "I Was Told to Come Alone: My Journey Behind the Lines of Jihad"". New Yorker. Condé Nast. Retrieved 14 April 2019. ^ Mekhennet, Souad (June 2017). "How a Journalist Uncovered the True Identity of Jihadi John". Longreads. Archived from the original on 29 August 2017. ^ Josie Ensor (25 September 2017). "Inside Jihadi John's lair: Britain's most notorious Isil terrorists unmasked together for first time". The Telegraph. Retrieved 27 September 2017. This page is based on the Wikipedia article Jihadi John; it is used under the Creative Commons Attribution-ShareAlike 3.0 Unported License (CC-BY-SA). You may redistribute it, verbatim or modified, providing that you comply with the terms of the CC-BY-SA.